This awesome new BlackVue accessory that is now in stock lets you view the rear video feed live from your DR650GW-2CH, DR650S-2CH (or DR650GW-2CH-TRUCK, DR650S-2CH-TRUCK) dashcam on the screen of your choice! Increase your safety by using a built-in OEM display (in-dash), or aftermarket screen to see what is behind you while you are backing up! This control module sits in-line between the BlackVue DR650GW/S-2CH front and rear cameras. On the wire harness, there is an RCA output that allows you to send the live stream from the BlackVue rear camera to any device that will accept an RCA video input. You can set up the control module to integrate with your vehicle (by getting the reverse signal) so that the rear video will come on automatically when the vehicle is backing up, or it can be configured in such a way that it will display the feed from the rear camera all the time on your screen. Either way, just like if the R-100 was not present, video from the rear camera is still always being stored to the memory card in case of an incident or accident. This is one of the best benefits of this setup and BlackVue dashcams in general: constant protection! 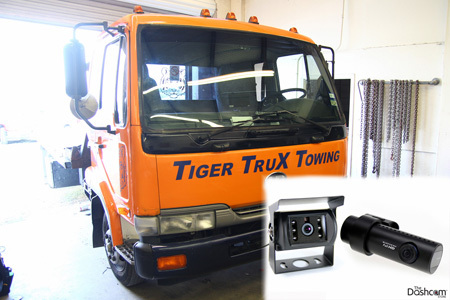 The R-100 can also act as a repeater, in those installations or vehicles such as tractor trailers or Class A RV's where the rear camera must be mounted farther away from the front unit than is typical. If you would like a 7" screen to be included with the control module, please see our BlackVue R-100 Backup Camera Display Kit!